Did you know that artificial trans fat is an artery-clogging synthetic blamed for 20,000 heart attacks and 7,000 deaths yearly? 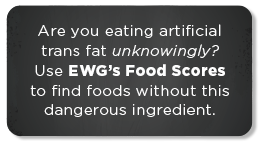 Even worse, did you know that you could be eating it without even knowing it? The U.S. Food and Drug Administration has just taken a major step forward by ordering food processors to stop using partially hydrogenated oils because they’re responsible for most artificial trans fat in processed food. But don’t expect grocery store shelves to be free of trans fat anytime soon. The FDA is giving food processors three years to reformulate. Besides, FDA rules allow manufacturers to label foods “zero trans fat” if they contain less than half a gram per serving. There’s more to do. By phasing out partially hydrogenated oils, the FDA has tackled a major source of the trans fat problem, but it hasn’t barred other ingredients that contribute traces of trans fat, including refined oils, fully hydrogenated oils and some emulsifiers, flavors and colors. Importantly, the FDA should close the loophole that allows food processors to round off less than half a gram per serving of trans fat to zero. Half a gram doesn’t sound like much, but it adds up fast—especially for kids.